Hiking in South Carolina can be a truly great experience. There are several moderate to difficult hikes that experienced hikers can enjoy. For the unexperienced or if you just want to go on a day hike, South Carolina also has several great trails. A moderate to difficult hiking trail is the Chattooga River Trail. Located on the Georgia-South Carolina border, the Chattooga River Trail follows the beautiful Chattooga River. Just recently a friend and I traveled down the trail starting in North Carolina at Bull Pen Road. The following information is about our hike. From Columbia my friend and I took separate cars so that we could hike without assistance. We traveled up I-26 and then onto I-385. We took a shortcut through Pelzer to I-85 and then went into Clemson. From Clemson we traveled up Hwy. 28 to Walhalla. We followed Hwy. 28 to the Chattooga River where we parked the first car. After the first car was parked, we traveled back down Hwy. 28 to Hwy 107 towards the North Carolina border. Once we crossed into North Carolina we took a left onto Bull Pen Road and parked at the trailhead. After parked we started on the trail. 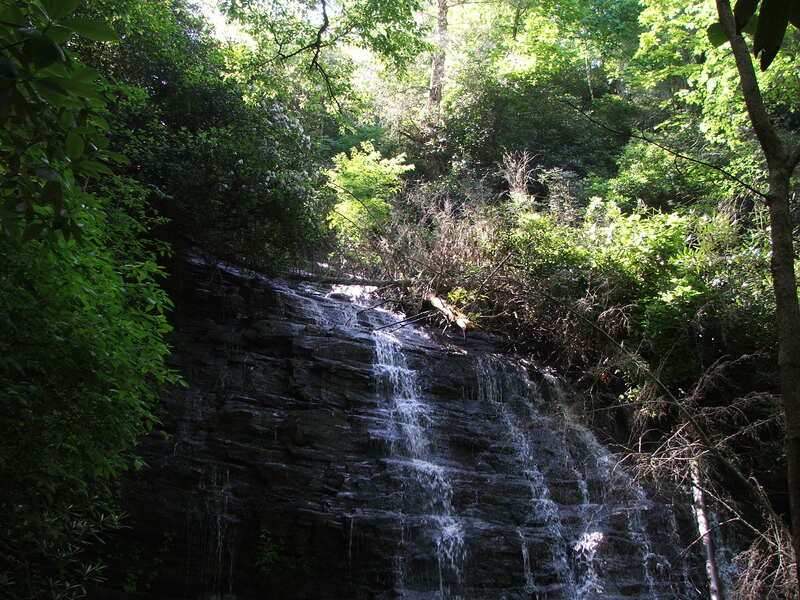 It is approximately 3 miles from Bull Pen Road to the Chattooga River. We traveled the 3 miles down the trail to the river and searched for a camp site. Since we did not use tents it was a little easier to find a camp site. There are not many flat places to pitch a tent along the river. We had ENO hammocks which are easy to tie to a tree. Once we found a camp site we started a small fire for warmth and settled down for the night. One of the places that I had hoped to see on the trail was Ellicott Rock. According to what I have read about the area a surveyor named Ellicott surveyed the boarders of North Carolina, South Carolina, and Georgia. The three states come together at Ellicott Rock. From the pictures I thought that the rock would be much bigger. But the rock wasn’t small either. We made a fire and ate, then we crawled into our hammocks and slept through a cold night. In the morning we started the fire again. I climbed out to Ellicott Rock and took some pictures. It was a nice, cool, beautiful morning. This morning we started off fresh. We saw Spoon Auger Falls and took a much needed rest after climbing a mountain just to see it. Then we hiked back down to Burrells Ford campground. Just past the campground was our stopping point for the day. We had decided to take it slow, only trying to hike about 5 miles a day. It was about 1:30 when we reached our second camp site. We went ahead and set up camp and started collecting firewood. I took a short nap while Patrick decided to go wading in the river. We were about 50-75 feet off of the river at a shallow spot. After my nap we started a fire and just chitchatted until supper. While collecting firewood I almost grabbed a copperhead. I snapped a picture of it. That night we sat up and talked about our spouses and my boys and then we started feeling homesick. So, we decided that on Sunday we would try to complete the rest of the trail and get back home a little early. Our original plan was to head back home on Monday. So, we’d be leaving a day early. The longest day. We started at a good speed. This would indeed be the hardest day of hiking and not just because of the distance that we’d be covering. The trail left the river and headed into the forest which was incredibly humid away from the river. Also we were climbing up a mountain. Once we were finally on top of the mountain everything else was pretty good. About halfway through the day the trail finally started heading back towards the river. Once it did, I needed to take a rest and collect some more water for my water bottles. I decided also to take a short nap to regain my strength for the last part of the trail. After I woke up, we ate a small lunch and started back on the trail. The trail came and went from the river, but we were determined to make it out and get back home as soon as possible so we kept trucking. Finally we came out on Hwy 28, but there were two parking lots on the hwy and I parked at the wrong one. So once we got out, we still had to hike about 2-3 miles down the hwy until we got to my car. After we got to the car we sat for a while and rested. After our rest we traveled down to Clemson to get a little bite to eat before heading back home. Patrick had a few blisters and my shoulders hurt for a while, but other than that everything was great.